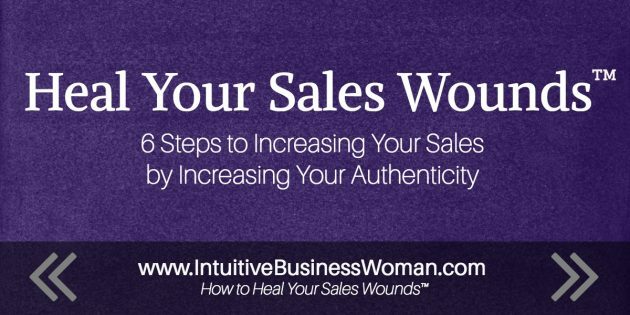 Sales Wounds™ are the fears & self-limiting beliefs that we all hold deep down inside that prevent us from selling more of our products and services, earning more money and growing our businesses. They’ve been inflicted on us by our parents, our culture and our own experiences both as consumers and as salespeople or business owners ourselves. 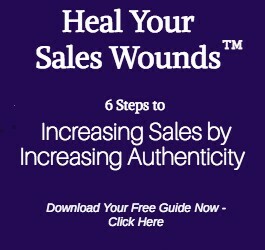 The good news is that Sales Wounds™ are easy to heal, once you know you have them! What follows is a description of the 6 primary Sales Wounds™, along with links to help you figure out which ones you’re suffering from most & steps to take to immediately begin to heal them. Keep in mind that while you often suffer from more than one of the Wounds, there’s always one Wound that is your primary blockage or obstacle. … is the fear that no matter what you do, money will always be your enemy. Note: If you have “money problems,” but you don’t feel any kind of resistance or negative feelings about money as described below, you’re suffering from one of the other Wounds, not the Money Wound™. This Wound can show up in a number of different ways, any one of which indicates you have work to do around your Money Wound™. Poor money management skills. Lots of late fees, increasing credit card debt, resistance to opening your monthly statements, etc. This one is easier to heal than you might think. Read 4 Steps to Money Manifestation. Beliefs that money is “bad.” If you have negative feelings about people with money, or about the bad, wrong or evil things that people do because of money or in the pursuit of money – you’re probably suffering from a Money Wound™. Read Lisa’s story, The Evil Corporate Giant. … is the fear that you can’t have both money and love, freely and in abundance. While almost all humans suffer from this Wound to some degree, it’s the most difficult one to recognize in yourself. That’s because its roots are deep in our early childhood, and it forms the basis of how we give and receive love in the world. To question it would rock the very foundation of our life, as well as our most important intimate relationships. The best way to understand The Love & Money Wound™ is to read case studies of people who have experienced it and healed it. Heidi: The Rich Housewife Archetype: Heidi is a 60-something professional woman with 4 grown children and 2 ex-husbands, whose first marriage is a perfect case study of the Rich Housewife archetype of the Love & Money Wound™. Lisa: When a Woman Wears the Pants: Lisa was an executive secretary with a $250,000 salary that dwarfed her husband’s. Her Love & Money Wound™ cost her her marriage; but when she healed it they found their way back to each other! … is the fear that successful sales requires you to be obnoxious, pushy and rude. … is the fear that people will respond with extreme negativity if you try to sell them anything (or “push something” on them, as you probably think of it), and this makes you extremely resistant to any act of salesmanship whatsoever. If you have this Wound, you probably know it. The big symptom is a flat-out unwillingness to sell, especially out of fear and insecurity about how people will react. But even if you know you have this Wound – and you can see how it’s having a big negative impact on your business – you may not want to heal it! This is because you have such negative feelings about selling, you simply don’t believe it’s possible to sell without irritating people, or even harming them. As a result, you don’t even want to get better at selling. To you it’s like saying, “I want to get better at scamming people.” So what you want is just to have more clients, earn more money and grow your business – but without you ever having to sell anything. Deep down inside, you know this won’t ever work for you. And trust me, I can show you how to become effective at selling your products and services, but do it in a way that feels good to you. Click here for more about the Anti-Selling Wound™ and how to heal it. … is the fear that people think you only do what you do for the money. The big symptom of this Wound is a sense of righteous indignation. If only the world were different in some way, you wouldn’t be forced to sell your products and services. … is the fear of being “out there” doing your work, even though another part of you craves being seen or recognized in a BIG way. The biggest indicator of this Wound is productivity issues. Overwhelm, procrastination, big projects getting started but never finished, etc. That, and also whatever logical explanation you inserted in the previous sentence! Click here for more about the Visibility Wound, including a quiz to see if you’re suffering from it.